The THEMIS Search Coil Magnetometer (SCM) measures low-frequency magnetic field fluctuations and waves in three directions. The search coil antennas cover the frequency bandwidth from 0.1 Hz to 4 kHz. They extend, with appropriate Noise Equivalent Magnetic Induction (NEMI) and sufficient overlap, the measurements of the fluxgate magnetometers (FGM). The NEMI of the search coil antennas and associated pre-amplifiers are not larger than 0.76pT/√Hz at 10 Hz, 0.08pT/√Hz at 100 Hz and 0.022pT/√Hz at 1kHz. The analog signals produced by the search coils and associated preamplifiers are digitized and processed inside the Digital Field Box (DFB) and the Instrument Data Processing Unit (IDPU), together with data from the Electric Field Instrument (EFI). Search coil telemetry includes waveform transmission, FFT processed data, and data from a filter bank. The search coils and their three axis structures have been precisely calibrated in a a calibration facility, and the calibration of the transfer function is checked on board, usually once per orbit. The tri-axial search coils implemented on the five THEMIS spacecraft are all working nominally. Roux, A., O. Le Contel, C. Coillot, A. Bouabdellah, B. de la Porte, D. Alison, S. Ruocco, and M.C. 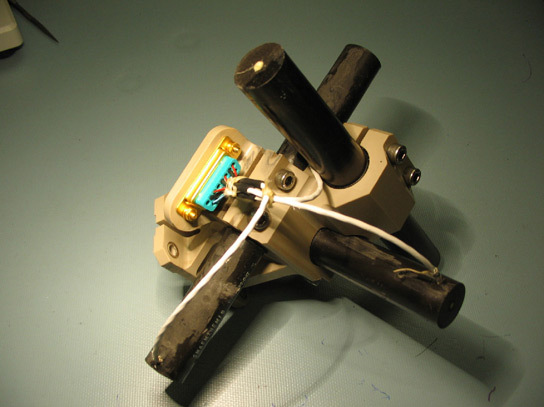 Vassal (2008), The search coil magnetometer for THEMIS, Space Sci. Rev., doi: 10.1007/s11214-008-9371-y. Le Contel, O., A. Roux, P. Robert, C. Coillot, A. Bouabdellah, B. de la Porte, D. Alison, S. Ruocco, V. Angelopoulos, K. Bromund, C.C. Chaston, C. Cully, H.U. Auster, K.H. Glassmeier, W. Baumjohann, C.W. Carlson, J.P. McFadden, and D. Larson (2008), First results of the THEMIS search coil magnetometers, Space Sci. Rev., doi:10.1007/s11214-008-9371-y. See also the web page about the French participation in the THEMIS mission: http://smsc.cnes.fr/THEMIS/.